Are you looking to work in a global business, with a £28,000 starting salary and a host of other fantastic benefits? Does the sound of working with market leading products appeal, or perhaps being involved with a football club is more your thing? If so, then Tangerine Holdings could be the company for you! We are looking for a number of high calibre graduates to join our Management Training Scheme. Our Animal Health business currently has offices in the UK, USA, Spain, Germany and Dublin and we distribute our products worldwide to over 40 countries from our offices in Lytham and Leominster. Our sister company Tangerine Leisure boasts a state of the art football stadium, sports bar, Mediterranean restaurant and conferencing suite. This is a fantastic opportunity to join a company at the head of its game, be involved in various projects, and learn about different areas of the business. If you are graduating in the next year, are projected a 2:1 or higher, are hard working, determined to succeed and want to be at the heart of a thriving business then this is the Management Scheme for you. **Applicants must have achieved at least a 2:1 in their degree and must be able to relocate to Lytham (Lancashire) and be able to drive. If you think you have what it takes to join Tangerine Group, apply now. Q1 What is your current role in the company? Q2. 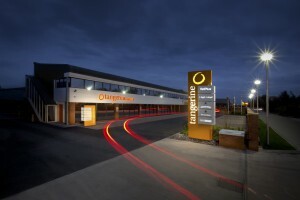 What is your career aspiration within Tangerine? The great thing about Tangerine, is that you never know what exciting opportunity is around the corner! No two days are ever the same and the work that I do is extremely varied. Working within all levels of the Company, I am constantly learning new working methods. My long term aim is to set up a new subsidiary for the Group. Q3. What do you view as the most important part of the Graduate Scheme? Upon searching for graduate schemes in my final year at University, I was overwhelmed by the number available. However, very few particularly stood out as offering a truly varied experience with the opportunity for extremely fast progression. At Tangerine, if you have a positive mind-set and are willing to work hard, the opportunities to succeed and progress within both the UK and international markets are endless. The experience that I have gained here over six years is invaluable.